2 FUTURE PERFECT will + have + 3. alak Két jövőbeli esemény közül a hamarabb kezdődő és a másik jövőbeli esemény / időpont előtt már befejezetté váló esemény (előidejűség) will have been + ing Két jövőbeli esemény közül a hamarabb kezdődő, és a későbbi esemény / időpont bekövetkeztekor még tartó esemény EGYÉB SZERKEZETEK Jövő idő kifejezése: a) Present Continuous alakkal: ha egy esemény már előre meg van szervezve b) Present Simple alakkal: - ha menetrendszerűen fog valami bekövetkezni - időhatározói mellékmondatban c) Going to-szerkezettel - ha a cselekvés még csak szándékban álló terv - ha az esemény bekövetkezésének a jelenben tapasztalható előjele van Múlt idő kifejezése: a) used to-szerkezettel: ha az adott cselekvés kizárólag a múltra volt igaz, de a jelenben már nem érvényes b) would segédigével: a cselekvés az adott személyre jellemző szokás volt. 1) Ask questions about the underlined parts of the sentences. 1. My friends are reading a newspaper. 2. Larry is whistling because he is happy. 3. I am giving a party next Saturday. 4. The students are going to travel to London. 5. Steve never writes letters. 6. Helen and Frank live here. 7. I always have some coffee for breakfast. 8. The train starts at 8.30 tomorrow. 9. He ll arrive in an hour. 10. We are going to buy a new car. 11. People saw the bank robber at the supermarket. 12. Kate drank a lot of milk. 13. Edison invented the gramophone. 14. Mike was waving his hands for some minutes. 15. Two girls were sitting in the car. 4 3. You look very thoughtful. What about? A, do you think B, are you thinking C, have been thinking D, did you think 4. 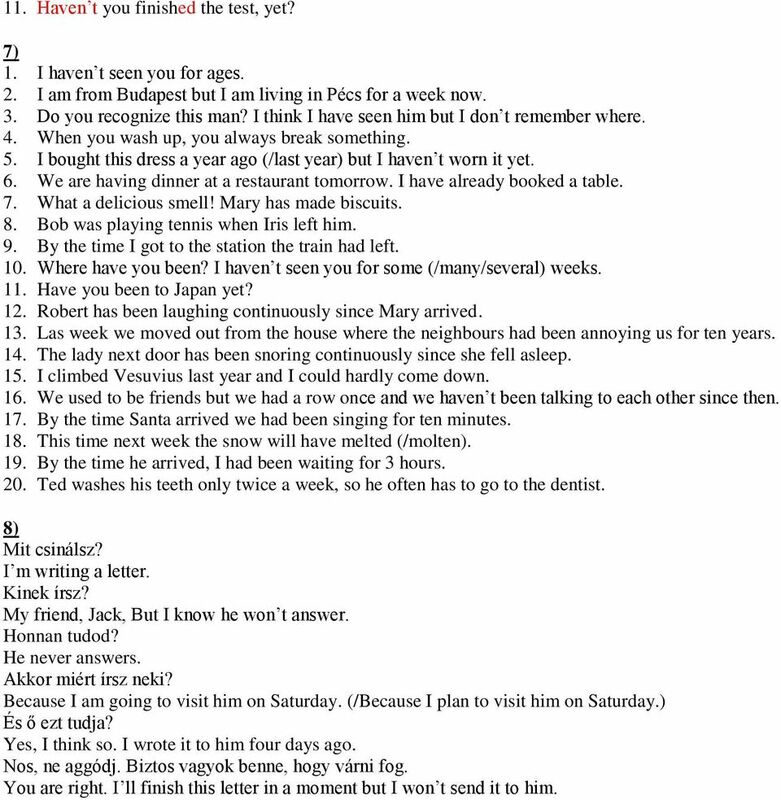 Which sentence is correct? A, Are you waiting for Peter here? B, Do you wait for Peter here? C, Wait you for Peter here? D, Do you going for wait for Peter Here? 5. My mother was ironing the clothes when I A, was entering. B, entered. C, have entered. D, had entered. 6. How long here by then? A, had you been living B, were you living C, have you been living D, did you live 7. How much cheese yesterday? A, have you bought B, had you bought C, were you buying D, did you buy 8. I the bathroom. Look, how nice it is! A, just finished B, had finished C, finished D, have just finished 9. We will write him when he to his village A, will return B, returned C, will have returned D, returns 10. As he I couldn t ask him anything. A, will already leave B, have already left C, had already left D, already leaves 11. to the United States? 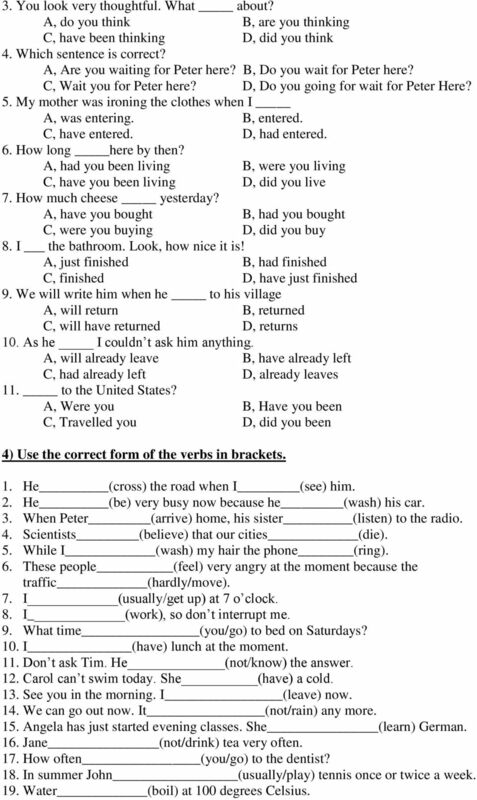 A, Were you B, Have you been C, Travelled you D, did you been 4) Use the correct form of the verbs in brackets. 1. He (cross) the road when I (see) him. 2. He (be) very busy now because he (wash) his car. 3. When Peter (arrive) home, his sister (listen) to the radio. 4. Scientists (believe) that our cities (die). 5. While I (wash) my hair the phone (ring). 6. These people (feel) very angry at the moment because the traffic (hardly/move). 7. I (usually/get up) at 7 o clock. 8. I (work), so don t interrupt me. 9. What time (you/go) to bed on Saturdays? 10. I (have) lunch at the moment. 11. Don t ask Tim. He (not/know) the answer. 12. Carol can t swim today. She (have) a cold. 13. See you in the morning. I (leave) now. 14. We can go out now. It (not/rain) any more. 15. Angela has just started evening classes. She (learn) German. 16. Jane (not/drink) tea very often. 17. How often (you/go) to the dentist? 18. In summer John (usually/play) tennis once or twice a week. 19. Water (boil) at 100 degrees Celsius. 6 something you (4) think of making a living out of, except maybe as a PE teacher. I don t know of anyone who..(5) as a career, except perhaps kids who went to Eton. Christie and his family..(6) from racial harassment on occasion at the hands of the police. He. (7) also been stopped more than once in order to explain why he (8) in possession of a new car. But he says these experiences do not mean that when he (9), he is, or ever. (10) fuelled by a sense of grievance. 1. A. starting B. started C. have started 2. A. was B. were C. has been 3. A. have B. had C. have had 4. A. could B. were able to C. can 5. A. think B. was thinking C. thought 6. A. suffered B. have been suffering C. have suffered 7. A. has B. have C. had 8. A will be B. is C. was 9. A is running B. has run C. runs 10. 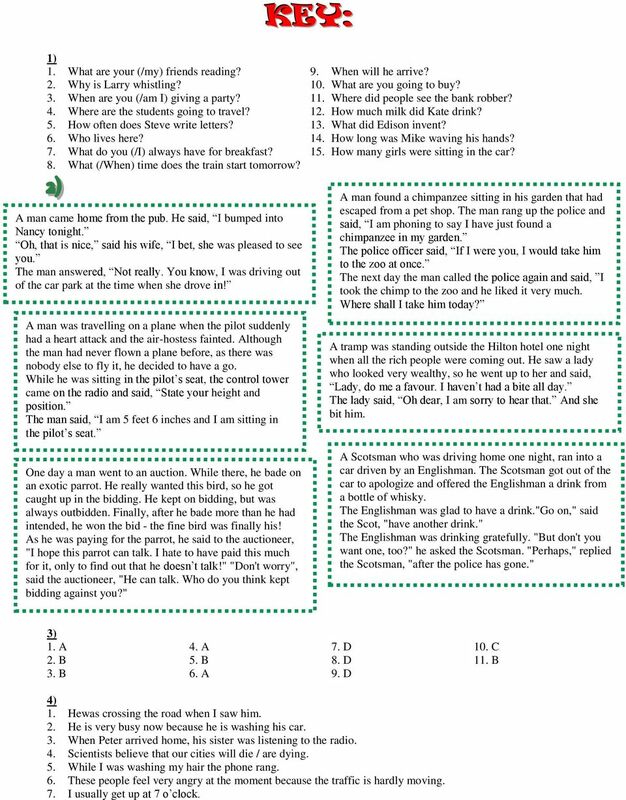 A is B. was C. has been 6) Correct the errors in the following sentences. 1. Paul not live in Spain, he live in Italy. 2. How long is your son usually watch TV every day? 3. My uncle has 48 years. 4. My friend is thinking that I often lie to him. 5. By the time she was 40, she will live in this town for ten years. 6. It s a surprise party and her friends won t know anything about it until they got there. 7. They have been learning for one hour when we called. 8. When the train came to a standstill, get on and try to find your seats. 9. I see the doctor tomorrow afternoon. 10. We just left the house. 11. Didn t you finish the test, yet? 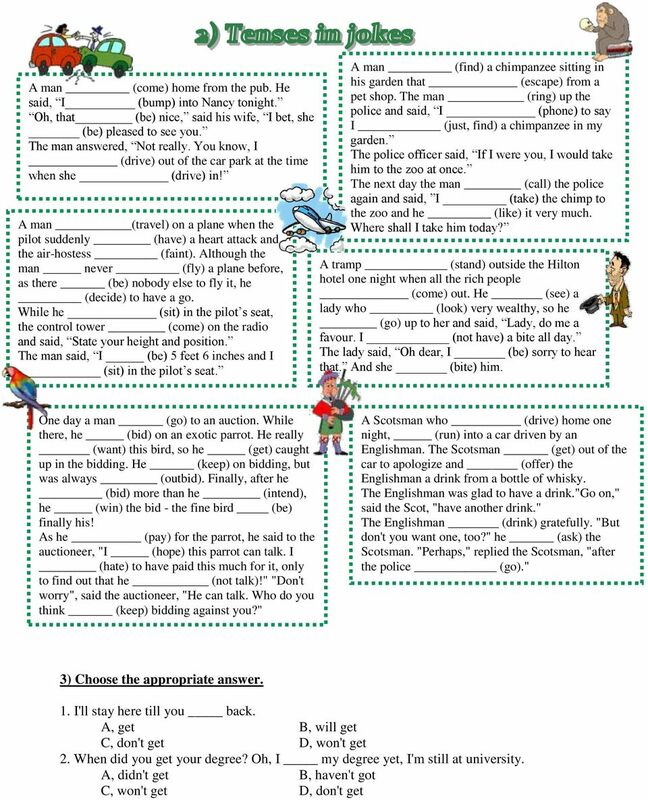 7) Translate the sentences into English. 1. Ezer éve nem láttalak. 2. Budapesti vagyok, de most Pécsett lakom egy hétig. 3. Felismered azt az embert? Azt hiszem láttam már, de nem emlékszem, hol. 4. Amikor mosogatsz, mindig eltörsz valamit. 5. Egy évvel ezelőtt vettem ezt a ruhát, de még nem hordtam. 6. Holnap étteremben vacsorázunk, már foglaltam asztalt. 7. Milyen finom illat! Mary süteményt készített. 8. Bob épp teniszezett, amikor Iris elhagyta. 9. Amikorra az állomásra értem, a vonat elment. 10. Hol voltál? Nem láttalak jó néhány hete. 11. Voltál már Japánban? 12. Robert egyfolytában nevet, amióta Mary megérkezett. 13. Múlt héten kiköltöztünk abból a házból, ahol tíz évig idegesítettek a szomszédok. 14. A szomszéd néni egyfolytában horkol, amióta elaludt. 15. Múlt évben megmásztam a Vezúvot, és alig tudtam lejönni. 16. Valaha barátok voltunk, de egyszer összevesztünk, és azóta nem beszélünk egymással. 7 17. Amikorra a Mikulás megérkezett, már tíz perce énekeltünk. 18. Jövő héten ilyenkor a hó már elolvadt. 19. Amikorra megérkezett, már három órája vártam. 20. Ted hetente csak kétszer mos fogat, ezért gyakran kell fogorvoshoz mennie. 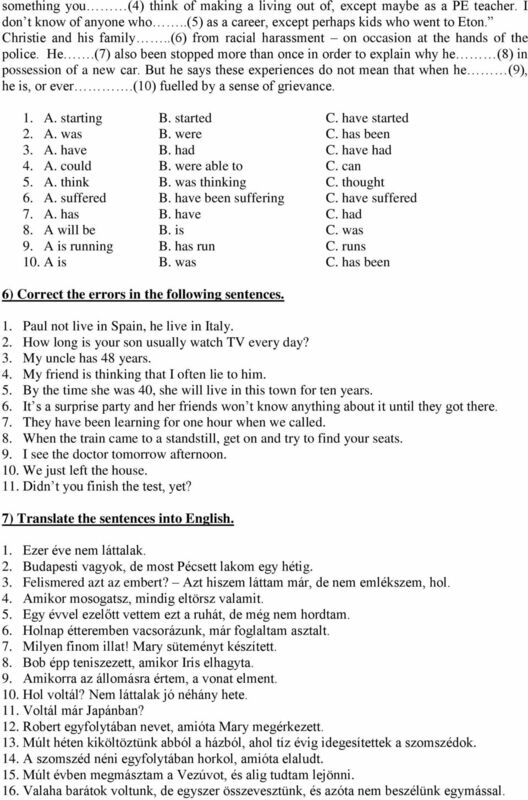 8) Translate the English sentences into Hungarian and the Hungarian sentances into English. A: What are you doing? B: Levelet írok. A: Who are you writing to? B: A barátomnak, Jacknek. De tudom, hogy nem fog válaszolni. A: How do you know? B: Sosem szokott válaszolni. A: Why are you writing him then? B: Mert szombaton szándékomban áll meglátogatni. A: And does he know about it? B: Igen, azt hiszem. Megírtam neki négy napja. A: Well, don t worry. I m sure he ll wait for you. B: Igazad van. Mindjárt befejezem a levelet, de nem fogom elküldeni neki. 8 KEY: 1) 1. What are your (/my) friends reading? 2. Why is Larry whistling? 3. When are you (/am I) giving a party? 4. Where are the students going to travel? 5. How often does Steve write letters? 6. Who lives here? 7. What do you (/I) always have for breakfast? 8. What (/When) time does the train start tomorrow? A man came home from the pub. He said, I bumped into Nancy tonight. Oh, that is nice, said his wife, I bet, she was pleased to see you. The man answered, Not really. You know, I was driving out of the car park at the time when she drove in! A man was travelling on a plane when the pilot suddenly had a heart attack and the air-hostess fainted. Although the man had never flown a plane before, as there was nobody else to fly it, he decided to have a go. While he was sitting in the pilot s seat, the control tower came on the radio and said, State your height and position. The man said, I am 5 feet 6 inches and I am sitting in the pilot s seat. One day a man went to an auction. While there, he bade on an exotic parrot. He really wanted this bird, so he got caught up in the bidding. He kept on bidding, but was always outbidden. Finally, after he bade more than he had intended, he won the bid - the fine bird was finally his! As he was paying for the parrot, he said to the auctioneer, "I hope this parrot can talk. I hate to have paid this much for it, only to find out that he doesn t talk!" "Don't worry", said the auctioneer, "He can talk. Who do you think kept bidding against you?" 9. When will he arrive? 10. What are you going to buy? 11. Where did people see the bank robber? 12. How much milk did Kate drink? 13. What did Edison invent? 14. How long was Mike waving his hands? 15. How many girls were sitting in the car? A man found a chimpanzee sitting in his garden that had escaped from a pet shop. The man rang up the police and said, I am phoning to say I have just found a chimpanzee in my garden. The police officer said, If I were you, I would take him to the zoo at once. The next day the man called the police again and said, I took the chimp to the zoo and he liked it very much. Where shall I take him today? A tramp was standing outside the Hilton hotel one night when all the rich people were coming out. He saw a lady who looked very wealthy, so he went up to her and said, Lady, do me a favour. I haven t had a bite all day. The lady said, Oh dear, I am sorry to hear that. And she bit him. A Scotsman who was driving home one night, ran into a car driven by an Englishman. The Scotsman got out of the car to apologize and offered the Englishman a drink from a bottle of whisky. The Englishman was glad to have a drink. "go on," said the Scot, "have another drink." The Englishman was drinking gratefully. "But don't you want one, too?" he asked the Scotsman. "Perhaps," replied the Scotsman, "after the police has gone." 3) 1. A 2. B 3. B 4. A 5. B 6. A 7. D 8. D 9. D 10. C 11. B 4) 1. Hewas crossing the road when I saw him. 2. He is very busy now because he is washing his car. 3. When Peter arrived home, his sister was listening to the radio. 4. Scientists believe that our cities will die / are dying. 5. While I was washing my hair the phone rang. 6. These people feel very angry at the moment because the traffic is hardly moving. 7. I usually get up at 7 o clock. 9 8. I am working, so don t interrupt me. 9. What time do you go to bed on Saturdays? 10. I am having lunch at the moment. 11. Don t ask Tim. He doesn t know the answer. 12. Carol can t swim today. She has a cold. 13. See you in the morning. I am leaving now. 14. We can go out now. It isn t raining any more. 15. Angela has just started evening classes. She is learning German. 16. Jane doesn t drink tea very often. 17. How often do you go to the dentist? 18. In summer John usually plays tennis once or twice a week. 19. Water boils) at 100 degrees Celsius. 20. The train is never late. It always leaves on time. 21. Did you go out last night? 22. I went to the cinema three times last week. 23. I was walking home when I met Dave. 24. Jane was waiting for me when I arrived. 25. Tom burnt his hand while he was cooking the dinner. 26. The doorbell rang while I was having a shower. 27. Tony was sitting and watching TV when I came to help him with his work project. I wasn t surprised as he usually does things like this at weekends. 28. Samantha is really overweight but she dances well. Last night when we came to the show, some people stood up and applauded during her last dance. 29. This morning I noticed that my cat was gone. I was very sad but in a few minutes I heard some weird sounds that came from the tree. I looked out of my window and saw my cat that was sitting there. My father took a ladder, climbed the tree and saved my cat. The neighbours were so curious that they were watching my dad all the time. 30. Roy bought a new bike yesterday. Today he decided to test it. But when he was riding it, the bike broke. Tomorrow Roy will return it to the store or he will fix it himself. 31. Yesterday while I was going home from the gym I felt very thirsty. Luckily, I saw a little girl who was selling lemonade. I came up to her, bought some and drank it. I felt very refreshed. 32. Every morning Lisa steps on her bathroom scales and weighs herself. She hopes she will lose some kilos soon as she joined a gym two weeks ago. She has already been there five times. 33. Julia eats a big hamburger every morning and drinks a lot of soda. She has put on a lot of weight recently. If she continues this way, soon she won t be able to fit into any of her favourite dresses. 34. An unbelievable story happened a week ago. My boss returned from a business trip and went straight to work. He was so tired that he fell asleep right among all the documents. When his secretary came in the following morning she saw that her boss was sleeping. The computer had been working all night while the boss was sleeping on the keyboard. 35. Jimmy s trainer is very strict. Look! He is shouting at him right now! He does this very often. He says that Jimmy doesn t do his best. 36. John was angry yesterday. He had been working on his report for more than 5 hours and then his computer broke down and all the information was lost. John got really mad and broke it! 5) 1. B 2. A 3. B 4. A 5. C 6. B 7. A 8. B 9. A 10. C 6) 1. Paul does not live in Spain, he lives in Italy. 2. How long does your son usually watch TV every day? 3. My uncle is 48 years old. 4. My friend thinks that I often lie to him. 5. By the time she is 40, she will have been living in this town for ten years. 6. It s a surprise party and her friends won t know anything about it until they get there. 7. They had been learning for one hour when we called. 8. When the train comes to a standstill, get on and try to find your seats. 9. I am seeing / will see the doctor tomorrow afternoon. 10. We have just left the house. 10 11. Haven t you finished the test, yet? 7) 1. I haven t seen you for ages. 2. I am from Budapest but I am living in Pécs for a week now. 3. Do you recognize this man? I think I have seen him but I don t remember where. 4. When you wash up, you always break something. 5. I bought this dress a year ago (/last year) but I haven t worn it yet. 6. We are having dinner at a restaurant tomorrow. I have already booked a table. 7. What a delicious smell! Mary has made biscuits. 8. Bob was playing tennis when Iris left him. 9. By the time I got to the station the train had left. 10. Where have you been? I haven t seen you for some (/many/several) weeks. 11. Have you been to Japan yet? 12. Robert has been laughing continuously since Mary arrived. 13. Las week we moved out from the house where the neighbours had been annoying us for ten years. 14. The lady next door has been snoring continuously since she fell asleep. 15. I climbed Vesuvius last year and I could hardly come down. 16. We used to be friends but we had a row once and we haven t been talking to each other since then. 17. By the time Santa arrived we had been singing for ten minutes. 18. This time next week the snow will have melted (/molten). 19. By the time he arrived, I had been waiting for 3 hours. 20. Ted washes his teeth only twice a week, so he often has to go to the dentist. 8) Mit csinálsz? I m writing a letter. Kinek írsz? My friend, Jack, But I know he won t answer. Honnan tudod? He never answers. Akkor miért írsz neki? Because I am going to visit him on Saturday. (/Because I plan to visit him on Saturday.) És ő ezt tudja? Yes, I think so. I wrote it to him four days ago. Nos, ne aggódj. Biztos vagyok benne, hogy várni fog. You are right. I ll finish this letter in a moment but I won t send it to him. ANGOL NYELVI SZINTFELMÉRŐ 2014 A CSOPORT A feladatok megoldására 45 perc áll rendelkezésedre, melyből körülbelül 10-15 percet érdemes a fogalmazási feladatra szánnod. Megoldásaid a válaszlapra írd! 1. Please stay here. Peter asked me to stay there. He asked me if I could do it then. Can you do it now? PAST ÉS PAST PERFECT SUBJUNCTIVE (múlt idejű kötőmód) Past és Past Perfect Subjunctive formáját csak néhány esetben kell használnunk. 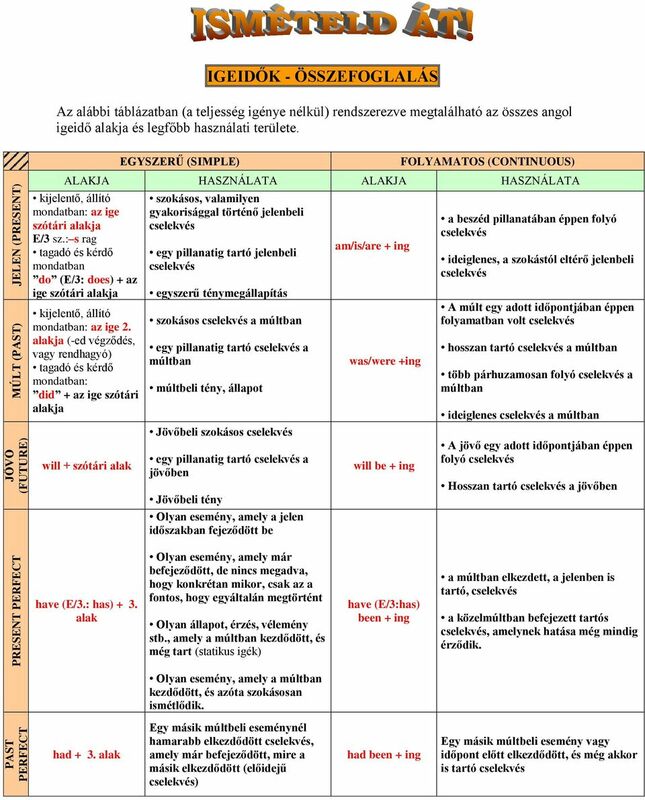 A célhatározói mellékmondatoknál és a feltételes mondatok II. és III. PONTOS IDŐ MEGADÁSA EGÉSZ ÓRÁK MEGADÁSA ( óra van. ) Az óra száma után tesszük az o clock kifejezést. pl. It s 7 o clock. (7 óra van.) A britek az órák számát csak 12-ig mérik. Náluk nincs pl. 22 óra! EGYSZERŰNEK TŰNIK IV. RÉSZ Lecke (Középhaladó 1. / 5.) MÉG TÖBBET A HAVE IGÉRŐL Igaz volt az előző leckére, igaz erre is. Részletes és átfogó. Kemény meló lesz ez is, de a kemény meló jellemző a profikra. A függő beszéd azt jelenti, hogy valakinek a szavait idézzük, de nem szó szerint, hanem tárgyi mellékmondattal (Azt mondja, hogy ; Azt mondta, hogy ). ANGOL NYELVI SZINTFELMÉRŐ 2008 A CSOPORT A feladatok megoldására 60 perc áll rendelkezésedre, melyből körülbelül 15 percet érdemes a levélírási feladatra szánnod. Sok sikert! 1. Válaszd ki a helyes megoldást. I must go now. He said he must leave early. You must learn the poem by heart. 33. Módbeli segédigék A módbeli segédigék a főigék cselekvési módjának körülírására szolgálnak, és a főigék főnévi igenévi alakjaival együtt használatosak. Különféle funkciókat fejezhetnek ki, mint pl. ANGOL SZINTFELMÉRŐ. Cégnév: Kérem egészítse ki John és Mary beszélgetését a megadott szavakkal! A szavak alakján nem kell változtatnia! ANGOL NYELVI SZINTFELMÉRŐ 2015 B CSOPORT A feladatok megoldására 45 perc áll rendelkezésedre, melyből körülbelül 10-15 percet érdemes a fogalmazási feladatra szánnod. Megoldásaid a válaszlapra írd! 1. Tel. : (+361)342-4905, FAX: (+361)342-1984 E-mail: rakoczi@mail.rakoczif.hu vagy rakoczif@mail.rakoczif.hu Honlap: http://www.rakoczif. EGY KIS ZŰRZAVAR. Lecke (Középhaladó 1. / 1.) SOMETIMES, SOMETIME VAGY SOME TIME? MIRE VALÓK A FOLYAMATOS PERFECT (Perfect Continuous) IGEIDŐK? MIRE VALÓK A FOLYAMATOS IGEIDŐK? Túlélő angol kezdőknek 10. lecke Ruhák (Fordítás - Megoldás) 1. a. We are writing letters. 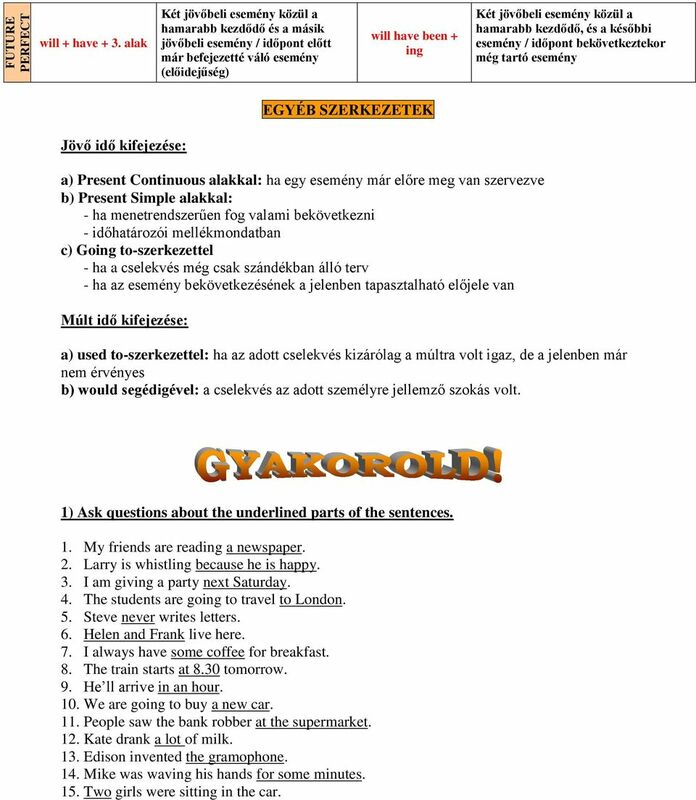 Leveleket írunk. (most) b. We write letters. (every day) Leveleket szoktunk írni. 2. a. I am wearing a blue T-shirt. A FUTURE PERFECT SIMPLE ALAKJA A Future Perfect Simple-nek két segédigéje van: WILL ez a jövő idejűséget segít kifejezni HAVE ez a perfect szemléletet kifejezni Ezeket használjuk minden számban és személyben. Let's Learn Hungarian! Lesson notes Lesson 1 On the train Dialogue for Lesson 1 (formal speech): Guard: Jó napot kívánok. Jó napot. Guard: Az útlevelét, kérem. Tessék. Guard: Köszönöm. Hmmmm, amerikai? Olvasd el a példákat figyelmesen! IDEGEN NYELVI MÉRÉS 2016. május 18. 6. évfolyam ngol nyelv Általános tudnivalók a feladatokhoz Ez a füzet nyelvi feladatokat tartalmaz. feladatsor két részből áll. z I. részben csak a füzetben kell dolgoznod. 7. Bemutatom a barátomat, Pétert. 8. Hogy hívják Önt? 9. Nagyon örülök, hogy találkoztunk. 10. Nem értem Önt. 11. Kérem, beszéljen lassabban. 1. Magyar vagyok. 7. Bemutatom a barátomat, Pétert. 13. Ért Ön engem? 2. Ön honnan jött? Te honnan jöttél? 8. Hogy hívják Önt? 14. Kérem, betűzze a nevét! 3 Beszél Ön angolul? 9. Nagyon örülök, hogy találkoztunk. Emelt szint SZÓBELI VIZSGA VIZSGÁZTATÓI PÉLDÁNY VIZSGÁZTATÓI. (A részfeladat tanulmányozására a vizsgázónak fél perc áll a rendelkezésére. (Összesen: 50 pont) Kossuth Lajos Gimnázium Angol nyelvi besoroló teszt (2013. február 20.) (A feladatlap 4 oldalas. Ne hagyj ki semmit! www.onlineangol.com Na de ennyire részletesen nem fogok belemenni, lássuk a lényeget, és ha kérdésed van, akkor majd tedd fel külön, négyszemközt. TANMENETJAVASLATOK. Általánosságban: egy lecke mindig egy heti anyagot jelent, a heti óraszámnak megfelelően. TANMENETJAVASLATOK Általánosságban: egy lecke mindig egy heti anyagot jelent, a heti óraszámnak megfelelően. a) változat (heti 3 óra) Egy leckére átlagosan 3 óra jut, de ehhez nem kell feltétlenül ragaszkodni.